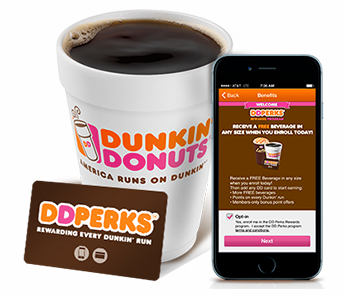 Free $5 Dunkin’ Donuts Gift Card! You are here: Home / FREEbies / FREE $5 Dunkin’ Donuts Gift Card! Get a FREE $5 Dunkin’ Donuts Gift Card! Enroll in join DD Perks and earn a $5 DD Gift Card when you use promo code JUNE! As a DD Perks member, you’ll receive a FREE drink when you sign-up, also on your birthday, and each time you get 200 points on your account! One dollar spent equals 5 points! Since you are drinking coffee anyway, get some FREE ones along the way! Sign-up now!